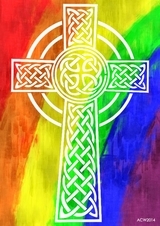 The Lindisfarne Community is an independent, ecumenical religious community in the Anglo-Celtic tradition. 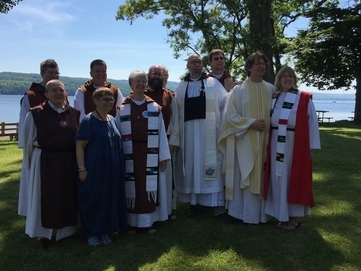 We are committed to the "new (or secular) monasticism." A friend of the community described us as "A religious order with apostolic succession." We have professed members in the USA, the UK, and Indonesia. Our mother house, the home of our abbess and abbot, is in Ithaca, NY. We have daughter houses: New Seeds Priory in Asheville NC, St. Cuthbert's Chapel and Priory in Madison WI, Wild Goose Hermitage in New London NH, Scripture House in Keane NH, Ninth Wave Hermitage, Ocean Grove, NJ, The Waystead Hermitage, Salt Lake City UT, The Hermitage of Light in Berwick Northumberland, and Peace Priory at St. Annes Grove, Boerne TX. Our spirituality is a balanced life of prayer, study, service and rest . . . . a new form of monasticism. We are relational, egalitarian, contemplative, sacramental and inclusive. We are part of a grass-roots movement, sometimes called "emerging church" exploring spirituality for the twenty-first century. We are deeply rooted in historical Christianity, yet are open to insights from other traditions. Our community prayer is "to be as Christ to those we meet, to find Christ within them." We have embraced emphases from, among others, the Celtic Christian communities of the fourth to ninth centuries in Northern Britain and Ireland; the desert fathers and mothers and the early monastic movement; the Christian mystics; the radicals of the sixteenth century; the charismatic, Christian feminist and home church movements of the twentieth century. Community members have received wisdom from Buddhist, Daoist, Hindu, Jewish, and secular traditions, in the belief that "all truth is God's truth." We have an annual retreat in the USA and occasionally in the UK. Join us at Casowasco, June 8-10, 2018, for the Lindisfarne Community Annual Retreat. To register, make payment for the retreat by check or online using the second link on our donation page. Jane and Andy Fitz-Gibbon are available to lead or speak at you next retreat. Lindisfarne Clergy are available for weddings. Please contact us. The first three books in the series are the community's prayer and liturgy resource, the history, understandings and personal stories of members, and the reflections of the community's abbot on theology, philosophy, practice, and life. Each book is available in hardback, paperback and on Kindle and Nook.